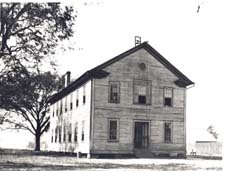 Fayetteville State University had its beginnings in 1867, when seven progressive African American citizens paid $140 for a lot on Fayetteville's Gillespie Street and converted themselves into a self-perpetuating board of trustees to maintain the property as a permanent site for the education of African American children in the area. Gen. O. O. Howard, an early supporter of African American education, erected a building on the site, and the school was named the Howard School in his honor. In 1877 the state legislature provided for the establishment of a normal school for the education of black teachers. Several areas of the state competed for this first state-supported academy, but the Howard School was selected because of its successful record. It became a teacher training institution known as the State Colored Normal School. In 1929 all high school work was discontinued at the Normal School, and in May 1937 the State Board of Education authorized its designation as a four-year college with authority to grant the bachelor of science degree in elementary education. The name of the institution was changed to Fayetteville State Teachers College in 1939. Under the leadership of James Ward Seabrook, president from 1933 to 1956, the school continued to progress. Another name change, to Fayetteville State College, occurred in 1963 after several additions were made to its physical plant. In 1969 the school became Fayetteville State University, and three years later it became a constituent institution of the consolidated University of North Carolina System. The facilities have advanced from a single building to a campus of approximately 156 acres and 36 buildings, with an estimated value of over $35 million. By the early 2000s Fayetteville State had a student body of just over 4,000 undergraduates and 231 faculty members. No longer exclusively a teacher training institution, the university offers 11 programs of study leading to the baccalaureate degree in 23 disciplines. Graduate degrees also are offered in education and business administration. Ella Louise Murphy, "Origins and Development of Fayetteville State Teachers College, 1867-1959: A Chapter in the History of the Education of Negroes in North Carolina" (Ph.D. diss., New York University, 1960). Howard School Founded and built in 1867. Originally located on Gillespie Street until 1902 when it moved to Ashley Heights. Named after General O. O. Howard of the Freedman’s Bureau. Image courtesy of UNCFSU. Joyner Hall, completed in 1930. Named in honor of Dr. J. Y. Joyner, State Superintendent of Public Instruction. Used as a dormitory for girls. Image courtesy of UNCFSU.